If there's one thing I hate about the awards season, it's the prevalent use of the reductive term "Oscar bait". Used to refer to a outdated idea of a typical Oscar contender, the term itself has become outdated following such outside the box recent award winners like "The Shape of Water" and "Moonlight". And yet, it was impossible not to think of that unsavory term while watching Jason Reitman's new film "The Front Runner". Not only does its title nod towards the common awards pundit lingo, but its conceit is clearly meant to tap into the political zeitgeist and thereby staking a claim towards Best Picture buzz. 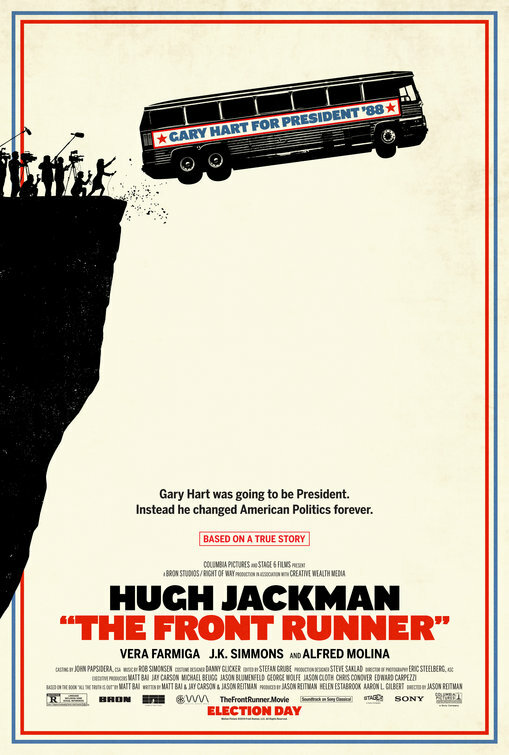 "The Front Runner" tells the true story of Gary Hart, a presidential candidate for the Democratic Party in the 1988 US elections. A charismatic and attractive family man who is committed to his ideals, he seems like the perfect choice to be his party's nominee. But his appeal backfires one day when media interest uncovers an extramarital affair which could derail not just his campaign, but his entire career in politics. In a time when the presidential controversy has become the norm rather than exception, "The Front Runner" offers an intriguing opportunity to reflect on early events which lead us to where we are now. Indeed, as an actual celebrity is currently presiding over the White House, Gary Hart is an interesting prototype for the uneasy balance between popularity and actual governance. Though his indiscretions pale in comparison to the horrifying ideologies proliferating today, his downfall raises pertinent questions about the high level of responsibility attached to public office. It's therefore disappointing then, that "The Front Runner" fails to live up to its potential. After establishing the characters and their motives, the film strays from a character study into a more shallow political thriller more befitting primetime television. Reitman's direction is overly reliant on flashy montages to inject energy into a rather mediocre screenplay. Despite a few good scenes, it falls short of truly digging in to the mind of its protagonist and the philosophical impact of his actions. Indeed, throughout the film I kept wishing the script could have been penned by Aaron Sorkin. With his knack for deconstructing brilliant but flawed men with a chip on their shoulder, Hart would have provided a great subject for Sorkin's lacerating wit. Furthermore, the cast would have certainly have been up to the cast, with J.K. Simmons and Vera Farmiga hinting at underutilized brilliance in their standout scenes. Sure, Hugh Jackman holds his own and may still find himself in the Best Actor conversation. But he too would have benefited from stronger writing. Overall, this is merely a decent film which could have been a great one. Rather than live up to its name, "The Front Runner" is running from the back of the pack in this year's Oscar race.